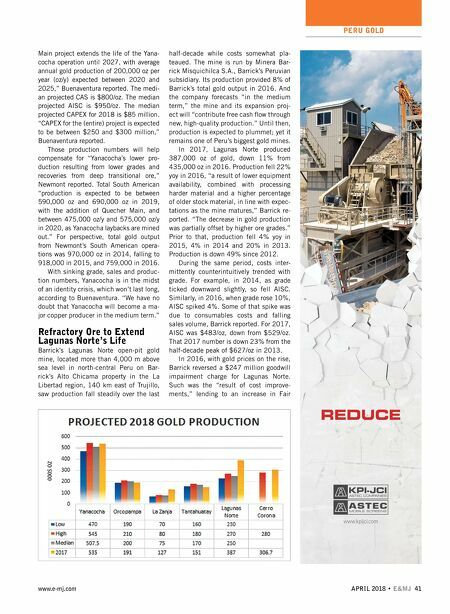 PERU GOLD 40 E&MJ • APRIL 2018 www.e-mj.com Buenaventura's top four mines face de- clining grade, and the combined total production from them, including Yana- cocha, has fallen for five straight years. It fell almost 20% year-over-year (yoy) in 2016 and 12% in 2017. When Cerro Corona (Gold Fields) and Lagunas Norte (Barrick) are added, the numbers reveal total gold production by Peru's top six big- gest mines has also fallen for five straight years. It plummeted 17% yoy in 2013, 19% in 2016 and 8% in 2017. It is off to a staggering 43% from 2012. Meanwhile, prices and thus net incomes are on the rise. For example, Buenaventura raised net income 119% yoy in 2017. Q4 raw earnings hit $254 million, an increase of 38% over the same period in 2016. This is allowing the mines to advance life-ex- tension projects, a couple of which will change the identity of the mines, the min- ers, and the country, as it slips from the ranks of the world's top gold producers and secures its status as second only to Chile in copper production. Production Slips at Yanacocha Last year, E&MJ ranked Yanacocha the ninth biggest gold mine in the world in 2016 by total gold output, falling from fourth place in 2015. It likely won't make 2017's top 10. The mine is still easily a major producer and an expansion project is in the works to extend the site's life and lift production numbers. However, barring rocketing gold prices, the mine likely won't be a gold mine for much longer. The open-pit mine, located 45 kilome- ters (km) north of Cajamarca, owned by Newmont (54.05%) and Buenaventura, began production in 1993. Buenaventu - ra, the operator, reported in 2016 that, to date, it had produced 36.7 million oz of gold, mostly from sulphide ore, which is mined from a pit as deep as 200 me- ters (m) and processed using heap leach. Pulp leaching at the site's plant process- es 20,000 metric tons per day (mt/d). Total gold output at Yanacocha is in steady decline. It fell 18% yoy, from 654,933 oz in 2016 to 534,692 oz in 2017. The median for its 2018 guidance is 507,500 oz, which would be a 5% de- crease yoy. For context, it fell 5% yoy in 2015 and a whopping 29% yoy in 2016. Capital expenditures hit $53.7 million in 2017. Those monies were slated last year for equipment and parts for the truck fleet and tailings dam work. Capital ex- penditures touched $83 million in 2016, which funded the expansion of a tailings dam, the construction of a water treatment plant, the procurement of equipment, and drilling activities at the Quecher project. Newmont reported that its costs appli- cable to sales (CAS) for its South Ameri- can gold operations for 2017 were $709/oz, down 7% from $759/oz in 2016. All-in sustaining costs (AISC), however, rose 13% from $1,058/oz in 2016 to $1,194/oz in 2017. AISC has risen 36% since 2015, and costs are not expected to settle in 2018 due to the mine "processing deeper transitional ore," Newmont reported. Historically, sales have been declining in tandem with total output. And by some figures, the mine operated at a loss of $60 million in 2017, compared to a $220 mil- lion loss in 2016. Rising gold prices en- abled the mine to effectively reverse a Q4 2016 $889.4 million non-cash impair- ment, according to Buenaventura. Yanacocha is engaged in hitting mile- stones on the Quecher project, named af- ter the site's Quecher Main oxide deposit. Last year, Buenaventura reported that "the technical works were finished, validat- ing the deposit in geological and metallur- gical terms, and the detailed engineering is currently being carried out for the expansion of the relevant heap leach. An exploration tunnel was completed as was some relat- ed drilling. Also, in 2016, the company at- tained government approval on an environ- mental impact assessment for the project. The decision to move forward with the project was calendared for Q2 2017. This year is apparently a transition year. Production starts next year with full produc- tion scheduled for Q4 2019. 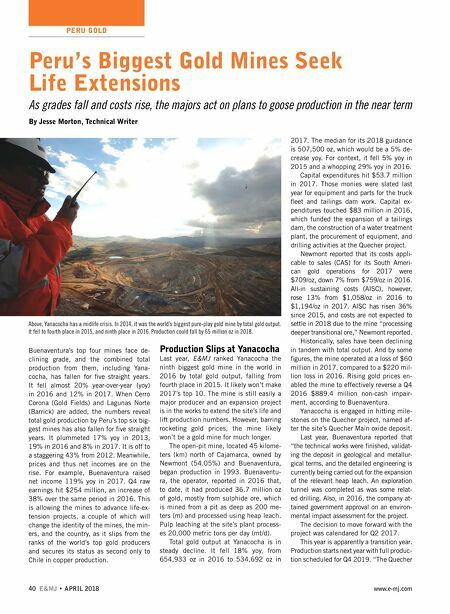 "The Quecher Peru's Biggest Gold Mines Seek Life Extensions As grades fall and costs rise, the majors act on plans to goose production in the near term By Jesse Morton, Technical Writer Above, Yanacocha has a midlife crisis. In 2014, it was the world's biggest pure-play gold mine by total gold output. It fell to fourth place in 2015, and ninth place in 2016. Production could fall by 65 million oz in 2018.